A Success Story – Lois Williams | Service Coordination, Inc.
Lois Williams was born in 1949 at Johns Hopkins Hospital in Baltimore, Maryland. She had a twin brother named Louis and the two shared a special bond as they grew up together in Cherry Hill. Lois is a lifelong resident of Maryland and raised four children in Randallstown in Baltimore County. In 1996, Lois moved from her home to be closer to her twin brother who was suffering from cancer. Lois cared for Louis as his illness progressed and he passed away a few months later. Lois was grateful to spend this time with her brother prior to his passing. Family has always been important to Lois. Distance and busy schedules prevent frequent visits, but Lois’s children and grandchildren hold a special place in her heart. She surrounds herself with pictures of her loved ones and these memories bring Lois comfort on a daily basis. Lois worked as a Personal Assistance Aide for a family-operated agency and developed a career of caring for others. She was a hard worker and assisted people who needed help with their daily needs for many years. Lois enjoyed her work but was forced to retire in 2012 when back pain began to limit her mobility. Throughout that same year, her pain became “intolerable” and she developed a shortness of breath that worsened as time went on. 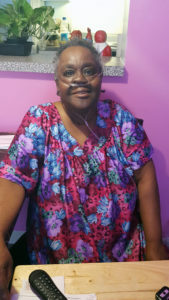 Unfortunately, Lois’s health continued to decline despite seeking medical treatment and in the summer of 2017, a referral was made by the Centers for Independent Living to the Community First Choice (CFC) program. They recognized that Lois was struggling on her own and could benefit from additional assistance. Supports Planner, Megan Fansler, was assigned. Megan worked closely with Lois to determine what services would be most beneficial to her. Lois was able to obtain a Personal Emergency Response System. This device is worn as a pendant on a necklace and allows Lois to call for assistance should something occur when she is alone in her home. Megan was also able to help Lois obtain a shower chair to make bathing safer and easier. During the Plan of Service process, Megan learned that Lois was hesitant to accept Personal Assistance Services. Lois was intimately familiar with the hard work involved in the care of others. She was concerned for the aide who may be assigned to help her. Lois was worried that time spent with her would be time that the aide would be away from their own family and these feeling made this process difficult for Lois. Even though Lois struggled to accept this service, Megan believed it could benefit Lois the most. Lois lived alone and had little informal support. Megan took a person-centered approach with Lois and expressed her understanding of Lois’s feeling. Megan provided encouragement that Lois needed throughout the planning process. Megan was able to help Lois understand that she had taken care of others for many years and she was now worthy of assistance during this time of her life. Megan’s thoughtful approach was successful, and Lois accepted 10 hours of Personal Assistance per week through CFC. A Personal Assistance Aide was scheduled. Over time, Lois developed a very strong relationship with this Aide. Lois said she looks forward to seeing her aide every week and accepts help with her personal care needs, preparing meals, grocery shopping and help with medical appointments.